The Bridge, a medical device worn behind the ear, delivers electronic pulses to ease the symptoms of opioid withdrawal. The company that markets the Bridge device claims that its electronic pulses stimulate branches of certain nerves that emanate directly from the brain to help people quit opioids. Jeff Mathews' treatment program, which operates out of the Union County Health Department in Liberty, Ind., helped collect data for the study of the Bridge. 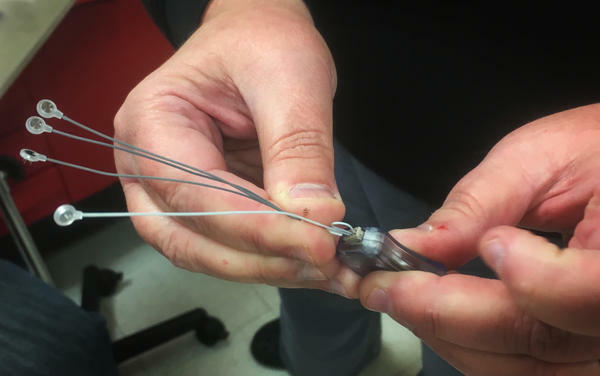 Brian Carrico, now the president of Innovative Health Solutions, worked with Dr. Arturo Taca to adapt the company's existing nerve stimulator so it could be worn during opioid withdrawal. In the face of a nationwide crisis of opioid addiction, people are eager for new solutions. Criminal justice officials in multiple states have started Bridge pilot programs. At least one such program in Indiana received state funds. Providers with a major hospital chain in Indiana began prescribing the Bridge. And politicians in Indiana, Utah and Ohio publicly touted the device. Innovative Health Solutions, the device maker, has marketed the Bridge for opioid withdrawal for more than a year, even before it had clearance for that use from the Food and Drug Administration. Then, last November, the Versailles, Ind.-based company got that, too. Citing the study, the FDA allowed the Bridge to be promoted for opioid withdrawal. Indiana State Sen. Jim Merritt, a Republican who is known for sponsoring legislation addressing the opioid crisis, held an effusive press conference after the FDA gave its OK to the Bridge. "People will detox," he told reporters. "They will withdraw from drugs if it's a simpler process, and this is it." But some addiction specialists aren't persuaded by the evidence behind the device. The study informing the agency's decision didn't randomly compare the experience of patients treated with the device with others who got a sham treatment. 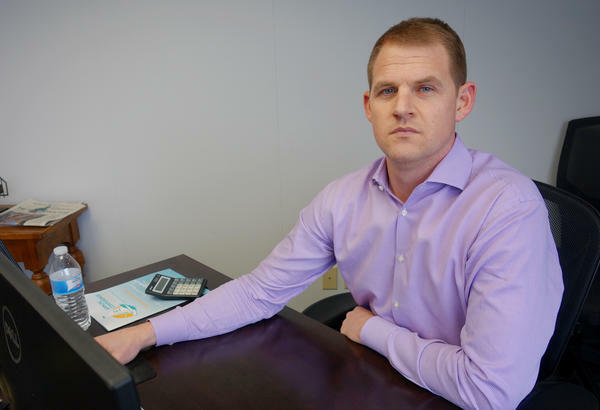 Andy Chambers, an addiction psychiatrist in Indianapolis, said there's no way to know if the $595 device works, or if patients and providers simply believe that it does. "For the sake of patients, I do hope the Bridge works," Chambers wrote in a letter published in the Indianapolis Star in November. "But for me to use it in regular practice, don't show me a sales job, or the enthusiasm of lobbyists, politicians or prosecutors; just give me the solid science." An investigation by Side Effects Public Media and NPR reveals that researchers working with Innovative Health Solutions, maker of the Bridge, submitted to a medical journal a study that wasn't what it appeared to be. The study authors said it was a "retrospective study," which means they would have simply reviewed existing medical data. But it seems that they instead conducted a clinical trial that skirted FDA rules and ethical norms, using vulnerable people suffering from addiction as test subjects. The FDA then relied on the results of the study in making its decision to clear the Bridge for marketing as a treatment for opioid withdrawal. In a response to questions from Side Effects and NPR, the FDA said it cleared the Bridge for use in opioid withdrawal because the study demonstrated "a clinical benefit that outweighs the risk of the device." The agency also said it is reviewing the issues raised by the investigation but didn't say what, if any, action it might take. Innovative Health Solutions said that company representatives and researchers followed FDA rules when the study was conducted. To Chambers, the FDA decision in favor of the Bridge was another sign of unsupported enthusiasm for the device. Chambers said policymakers and clinicians should support the use of proven therapies, instead of the Bridge. "You're potentially draining money away from other treatments that we know are efficacious," Chambers said. On a cold December afternoon in Liberty, Ind., James was sweating. (Because of his drug use, Side Effects and NPR agreed not to use his full name to protect his identity.) He showed up at the Union County Health Department to get help with his opioid withdrawals. It had been two days since he last used. "I get hot and cold chills," he said as he waited. "In two seconds, it changes. It's crazy." His dark hair, flecked with gray, was damp with perspiration. His legs ached, he had diarrhea and hadn't slept the night before. After several minutes a nurse ushered James into an exam room. She assessed his withdrawal symptoms, and then began to fasten the Bridge around his ear, tiny needles piercing his skin. When the final electrode was in place, James said he could feel the mild pulse of electricity emitted by the device. The company claims these pulses stimulate branches of certain nerves that emanate directly from the brain. The idea is that this stimulation can relieve symptoms of withdrawal. James had used drugs since his teens. He'd tried to quit before, but couldn't. 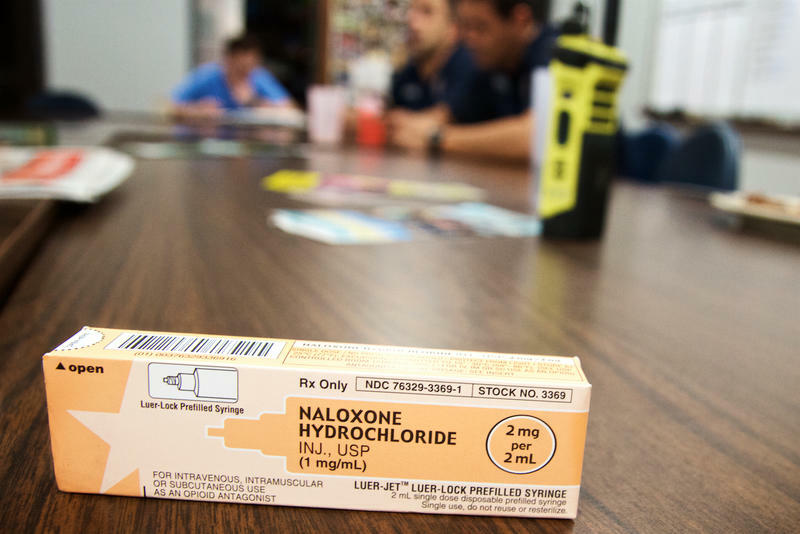 Jeff Mathews, a county official who runs the treatment program, told James the Bridge could help him stop using opioids so that he could get treatment with Vivitrol, a monthly shot of the opioid-blocker naltrexone. "I know this thing sounds too good to be true," Mathews told him. "I've seen it repeatedly. It's going to do exactly what we say it does." Over the next hour, James said his symptoms got better. He stopped sweating, his mood improved and his goosebumps disappeared. "I'm ready to quit," said James. "I want my family back." "I'm sure they want you back, too," the nurse replied. The nurse told James to leave the Bridge in place and come back five days later. If he tested negative for opioids, he'd move on to Vivitrol. The idea of using the Bridge for opioid detox came from Arturo Taca, an addiction psychiatrist who practices near St. Louis. Taca worked with Brian Carrico, now the president of Innovative Health Solutions, to adapt the company's existing nerve stimulator (a device which was already cleared by the FDA for treating pain in 2014) so it could be worn during withdrawal, as the website STAT previously reported. Taca also developed instructions for using the device as a "bridge" to treatment with Vivitrol. Taca started promoting this use of the device. Innovative Health Solutions did, too, as early as 2016, before it had gotten the green light from the FDA for this use. Without explicit permission, this marketing by the company is called off-label promotion, which violates FDA regulations. "They are not allowed to promote off-label use period, whether it's to a physician, whether it's to a judge, whether it's to just a random person in the public," said Basia Andraka-Christou, a health policy researcher at the University of Central Florida who reviewed the company's presentation. There is an obvious market for the Bridge. 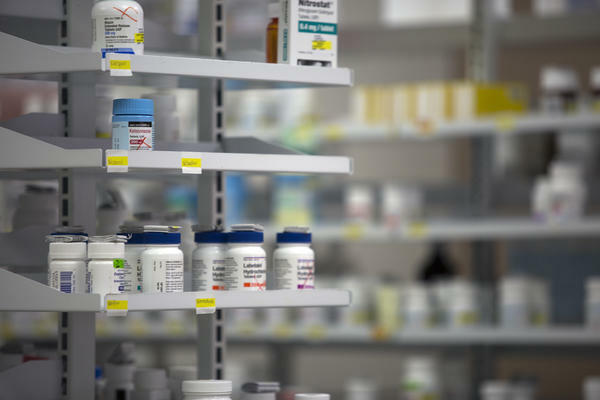 As Side Effects and NPR reported last year, Alkermes, Vivitrol's manufacturer, had been aggressively pushing its medicine to lawmakers and in criminal justice settings. Vivitrol, an opioid-blocker, can be especially appealing to people who are opposed to the other two FDA-approved medicines for opioid addiction — methadone and buprenorphine — which are both long-acting opioids themselves. They ease symptoms of withdrawal and reduce cravings, but some critics view them as replacing one opioid with another. The Bridge can appeal to Vivitrol advocates, because to start that medicine, patients need to make it through opioid withdrawal. But for Innovative Health Solutions to legally market the Bridge for opioid withdrawal, it needed the FDA's OK. To get it, the company presented the agency with results from a study published in the American Journal of Drug and Alcohol Abuse in March 2017. The paper was written by Taca and Adrian Miranda, a pediatric gastroenterologist and professor at the Medical College of Wisconsin. Reporting by Side Effects and NPR shows that the company and study authors took shortcuts in the research that violated FDA regulations. The authors call it a "retrospective assessment," claiming they reviewed medical records from patients who had been treated with the Bridge. But it was not a retrospective assessment, reporting by Side Effects and NPR finds. Innovative Health Solutions and Taca recruited health care providers to conduct a clinical trial. The company and Taca told them to measure withdrawal symptoms at specific intervals. According to instructions laid out in documents obtained by Side Effects and NPR, providers would then submit those data online, which wouldn't have been necessary unless the data were being gathered for study purposes. The FDA requires strict oversight of clinical trials to protect patients and ensure the study results are valid. The Bridge study had no such oversight. 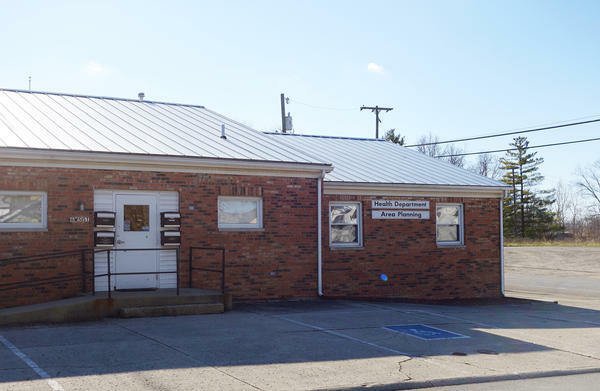 The treatment program in Liberty is run by Jeff Mathews, a retired Navy man, who heard about using the Bridge for opioid withdrawals from Carrico in January 2016. Mathews was intrigued. "If this thing does what you say it does, this is a game changer," he told Carrico. Mathews said he struck a deal with the company. "I'm a shrewd negotiator," he said. "I negotiated free devices for the information that we were going to give back." Mathews agreed his program would collect data on Bridge patients and send it to the company. Innovative Health Solutions disputed this characterization, saying in an emailed statement, "It was not a quid pro quo." Taca helped them implement the protocol later described in the 2017 paper, and Mathews said his group prescribed its first Bridge a month later. Another provider, Katrina Lock, a nurse practitioner who runs a clinic in Rising Sun, Ind., said she began using the device on patients around Thanksgiving 2015, after she was approached by Tom Carrico, chief regulatory officer for Innovative Health Solutions and Brian Carrico's father. She said Tom Carrico told her the company was trying to clear FDA hurdles in order to use the Bridge for opioid addiction, and she agreed to do "some testing with the Bridge for him and for the company." Taca himself provided much of the data for the research from his clinic, and appeared to be recruiting participants. In April 2016, he posted in a Facebook group that he was conducting a study, and asked people to call his clinic. Brian Carrico insisted the research was conducted according to FDA regulations and that it wasn't coordinated in advance. "We as a company cannot give anyone a protocol and we never have," Carrico said in an interview. Clinical trials with FDA-regulated devices require oversight from institutional review boards, or IRBs, which protect patients by ensuring the benefits of the research outweigh the risks. Adrian Miranda, Taca's co-author, got approval for the study from an IRB at Medical College of Wisconsin, but it was for a retrospective review — not a clinical trial. David Clark, who oversees the IRB at Medical College of Wisconsin, said he did not know that the research was a coordinated effort. "There has to be an IRB review for stuff like this," said Clark. An IRB would have evaluated the study's adherence to FDA rules and ethical standards guiding clinical trials and could have required changes to protect the interests of patients and the validity of the data. "Most studies of withdrawal are done in residential settings, where people are under pretty continuous monitoring and observation," said George Bigelow, a professor who heads an IRB at Johns Hopkins University. If patients leave the study site, they may use illicit drugs or over-the-counter medications, skewing the results. Patients could also relapse and never return, and providers involved with the study told us this was a common occurrence with the Bridge. Under Taca's protocol, patients were sent home once after an initial assessment and again after getting the device. The plan then was for patients to come back after five days for a final evaluation and possible Vivitrol treatment. But without monitoring and support, the time spent at home led many patients to drop out of treatment. "There was a fair amount of people that didn't show up," Lock said of her patients who were assessed for the Bridge. "And then there was a few people that didn't show back up to get them taken off." Paul Finch, a physician assistant in Fairbanks, Alaska, who gathered data for the study, said he has now used the device dozens of times. He estimated that a little more than half of his Bridge patients successfully complete the detox. "Two-thirds of those will go on to get Vivitrol shots," he said. "None of it's perfect." In a clinical trial, researchers would normally report how many people completed a study and how many dropped out so it's possible to better gauge how successful a treatment is. The published study says 73 people were included in the study. Sixty-four people went on to take Vivitrol or naltrexone; the other nine didn't. However, the researchers didn't report how many people dropped out, either after their assessment or after receiving the device. "If you treat 10 people successfully and crow about it, but 90 people dropped out ... that's pivotal," said Medical College of Wisconsin's Clark. Clinical trials also require informed consent from patients to make sure they understand the risks and benefits of participation. But it's unclear if patients in the Bridge study even knew they were part of an experiment. The study states that the researchers did not obtain informed consent. At least one provider indicated they told patients they were part of a trial and that the Bridge was not a proven treatment for withdrawals. Another did not. Autumn Howard, a 30-year-old patient who used the Bridge in Mathews' program in April 2016, said staff told her the device was experimental, but she couldn't remember whether she was told she was part of a study because her withdrawals were too intense. "It was kind of a blur," Howard said. "I couldn't read ... I don't even know pretty much a lot of what they said to me when I got there." James, the patient who was treated with the Bridge at the Union County clinic in December, said he didn't know his data were being collected for additional research into whether the device works. While the study by Taca and Miranda had already been published in March 2017, Mathews said he was still sending data, including James', to the company. This points to further clinical research, said Jody Madeira, a professor of law at Indiana University, which would also require IRB oversight and informed consent. Carrico initially told Side Effects and NPR that there are current research efforts underway, but the company later declined to say what IRB might be involved or where that research is being conducted. James signed an informed consent document just before he got the Bridge, but it was so faded it was difficult to read. Side Effects and NPR obtained a copy of the form, which does not mention a study, or even withdrawals. "This is in no way a form that would ever suffice for research," said Madeira, who reviewed the document. The day after he got the Bridge, James shared a photo of himself with the device still behind his ear. But he texted that it stopped working the next day. He started to feel sick again and relapsed. "I'm on man," he texted in December. "I haven't even called the office at all just didn't go back." When we contacted him in April, James said he still hadn't gone back to get a new device. "They haven't tried to contact me or nothing," he said. IRB oversight might have caught another problem with the study. In 2015, Taca applied for a patent on his treatment method. If approved, Taca could license it to the company and get a slice of the money made from Bridge sales. Taca didn't disclose the patent application and the potential financial conflict to the American Journal of Drug and Alcohol Abuse. The IRB at Medical College of Wisconsin never knew about it either, because Miranda left Taca's name out of the research proposal. "This is an enormous, astonishing, unbelievable conflict of interest," said Jake Sherkow, who teaches patent and FDA law at New York Law School. "It casts significant doubt on the results of the study." After NPR and Side Effects contacted the journal, it posted a correction noting the possible conflict of interest. Neither Taca nor Miranda agreed to an interview for this story. Miranda now works as chief medical officer for Innovative Health Solutions. Experts we consulted found the ethical and regulatory issues in the study troubling. "In an ideal world, the journal would retract the article and the FDA would take the product off the market until an appropriate study was done," said Diana Zuckerman, president of the National Center for Health Research. Bryon Adinoff, editor of the American Journal of Drug and Alcohol Abuse, which published the study, said the journal would review the study to decide whether to retract it. Despite the study's flaws, FDA clearance means the company can now legally market the device for detox, and Carrico is asking insurers to cover it. The day after the FDA decision, the company reached out to Chambers' colleague at the Indiana University School of Medicine to inquire about setting up a conversation about the Bridge with a group of addiction treatment providers. The company was following up on an invitation from the medical school extended weeks before. But Innovative Health Solutions representatives had some preconditions. "What we would not like is any negative energy, non-believers or multiple questions about efficacy," one wrote to Chambers' colleague. Chambers said the message fits a disturbing pattern: The opioid epidemic was fueled by pharmaceutical companies making misleading claims about the risk of addiction with opioid painkillers. Now, Chambers said, Innovative Health Solutions appears to be to ignoring the role of science and overstating its evidence to exploit the addiction treatment market. "A cult is what comes to mind when I hear 'nonbelievers,' " he said. He thinks there's a real risk policy makers and providers may be swayed by the company's overly enthusiastic marketing. As far back as 2016, well before the device was cleared for this use, Carrico started talking to Indiana lawmakers about how the Bridge can help with opioid withdrawals. Republican lawmakers even started talking about getting Medicaid to pay for it. "I think it became almost a joke," said a state official at Indiana's Family and Social Services Administration. "Every meeting that you attend with a legislator ... was all about the Bridge." Chambers is worried. 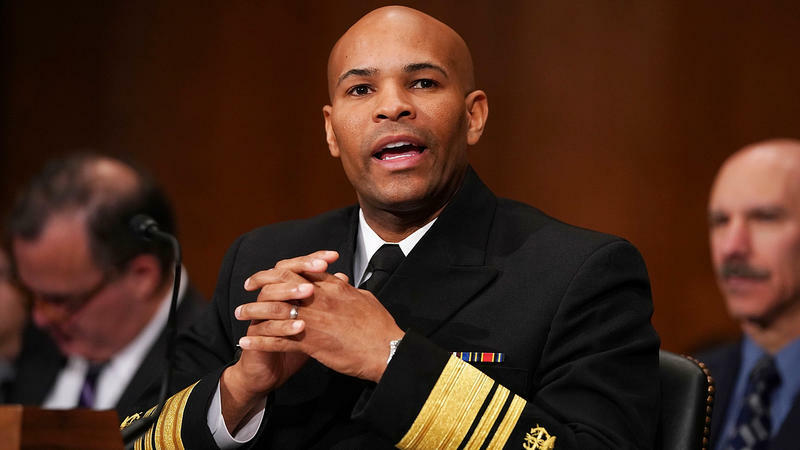 "The desperation to treat opioid use disorders is so great that the doors are wide open for non-science to come in to drive practice," he said. But Brian Carrico remains a believer. "I'm still looking for the first device that didn't work. I keep asking and no one can find it," Carrico said in an interview. 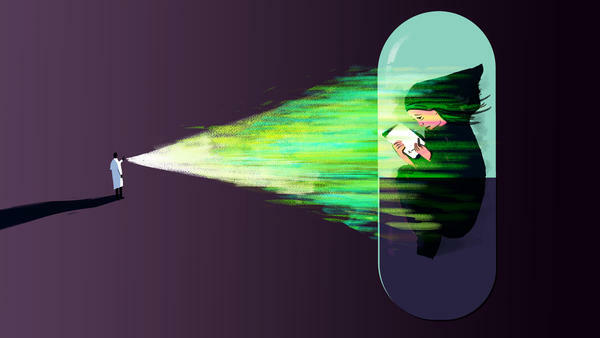 "If it was placebo, it's 100 percent placebo. That's the best placebo I've ever seen." This story was produced by Side Effects Public Media, a reporting collaborative focused on public health, in partnership with NPR. You can follow Jake Harper on Twitter: @jkhrpr. There's a device on the market that is supposed to help people who are trying to quit opioids. The FDA has allowed the device based on a study, but that study may have serious flaws. Jake Harper from our member station WFYI in Indianapolis wrote an article for NPR's Shots blog, and he joins us now to talk about it. Hey, Jake. MARTIN: Let's start off by just explaining what this device is, what it's supposed to do. HARPER: Sure. So the device is called the BRIDGE, and it looks a little bit like a hearing aid. It attaches around your ear with these little electrodes, and those electrodes deliver a mild electrical pulse that in theory reduces the symptoms of opioid withdrawal. MARTIN: Which, I imagine, can be overwhelming. Just describe what those symptoms are like. HARPER: Most people I've talked to compare it to the flu but they say it's five times worse. The symptoms can include hot and cold sweats, joint pain, diarrhea and vomiting. And you basically just end up laying in bed for days. So it's pretty miserable. MARTIN: OK. So what did you find out about this device and how it works or doesn't work? HARPER: So in November of last year, the FDA gave the company permission to start marketing the BRIDGE, and that permission was based on a study. And when we looked into it, we found that the study had some pretty serious flaws. 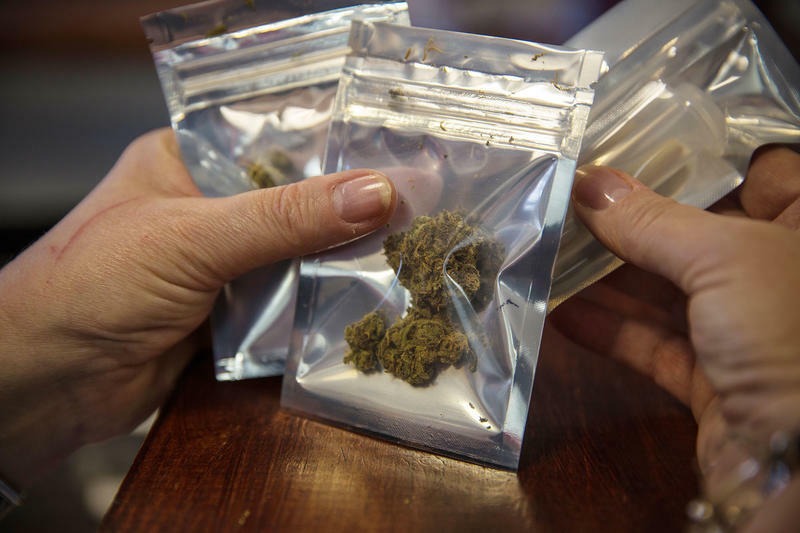 The researchers, they published it as a retrospective assessment, which means they looked at medical records after providers had treated patients in withdrawal and pulled data out of those records. But actually talking to those providers, it looks like the company and the researchers had actually conducted a clinical trial. They were actively performing an experiment on people with addiction trying to see if this device works, and they didn't get the proper oversight that would be required by the FDA to do that. MARTIN: So the bottom line is that this company didn't get the right oversight for this device. What are the consequences of that? HARPER: Yeah. So those FDA guidelines are designed to do two basic things. One is to protect patients. Addiction is a dangerous disease so when someone is finally ready to go in and get treatment, you want to make sure that they're offered something that's proven to work. Or if they're part of an experiment, you want to make sure that they understand that and that they know what the risks are. The other thing that oversight would have done is ensure that the data that researchers were collecting was valid. One of the really common issues in addiction studies in general is dropout, and that was definitely an issue with the BRIDGE. I actually followed a patient through his experience, and he said he felt better right after the device was put around his ear, but a couple days later, he said it stopped working for him and he went back to using opioids. But the researchers left that kind of information out of the study. Another thing that we found that was missing was that one of the study authors had applied for a patent on a treatment regimen using the BRIDGE, which could be a pretty significant conflict of interest and something that you want to keep in mind, that the author might have some potential bias. MARTIN: But, I mean, we clearly live in a time where the opioid crisis is at such proportions, everyone's desperate to try to come up with ways to address this. So I imagine that's why something like this particular device, even if the results are questionable, it would still be appealing to a lot of people. HARPER: Yeah. So there are a lot of politicians in particular who are really interested in this technology. It's made here in Indiana. It's potentially a non-opioid treatment tool so it is very appealing. And around the time of that presentation to the legislature, I was told that lawmakers went to the state Medicaid agency and were basically pushing for the device to be covered. I think it's important to say that it's definitely possible that this device works, but addiction professionals that I've been talking to are worried that policymakers see this as part of the solution to the opioid epidemic when really there isn't scientifically validated evidence to support that yet. MARTIN: Jake Harper. Jake's article appears on NPR's Shots blog today. He is part of NPR's reporting partnership with Side Effects Public Media and Kaiser Health News. Jake, thanks so much for sharing your reporting on this. HARPER: Yeah. Thank you. Transcript provided by NPR, Copyright NPR. New data show that the number of prescriptions for opioid painkillers filled in the U.S. fell dramatically last year. They showed their biggest drop in 25 years.